I had some material about tuning on EL71, and like i was apply in S75, i like to apply Big Digital Clock on MS, i search whole nets, and found Digiclock11, but it crashed my EL71, i search too all parameters on Extrainfo, it's just time, to tiny for me. Does anyone know what patch or elf file that i can use. Oh... Digiclock on mainscreen? I'll ask Evgr to find working one if it's real. ExtraInfo elf supports png-fonts - just take the biggest or make it yourself... And, of course, EInfo can use mobile system fonts. Set the number of font in Time and use. I don't like to see too many clocks on screen I prefer patch to see big time instead of sign "Keys blocked" - that's comfortable. It seems, the last version of ExtraInfo is 2.20. Wow thanks sim_emrom, the last idea, at extrainfo, i use version 2.0, i haven't think about it. Now i can set the big digiclock with it. About Digiclock v11, i allready found one in this forum, it's working, but there are no option for spacing, with extrainfo we can do spacing in pixel. Friends, want a ask something, it's about GPN2, before i use EL71, i used S75, and often using GPF/GPN file instead of .PNG files. I used to create GPF/GPN using GPF Factory, then straightly transfered to Misc/GPF to make things possible. Well, when i'm trying this on EL71, it doesn't change existing image, i mean the GPF/GPN files. When i open FUBU on Smelter, GPN2 was sign cheked, i wonder maybe SGold2 only support GPN2, not GPF or GPN. What's make different? How can i create GPN2 files, what tools? And last is it more efficient to use GPN compared with .PNG files? It's difficult... I don't use any graphic files except png, so I can't say anything. S75 is already SGOLD2. All the problems are in the screen...240x320 needs gpf2, I think they will work. We have a good program E71seriesGC (graphic changer) - look for it in "Programs"-discussions at this forum. Well, when do you usually get this p-exit? 2) Set more png-cache for ElfPack. 3) Try switching off some elf-daemons. Oke i'll apply it right away, and sorry sim_emrom, is there any max threshold value which i can use on PNG Cache? By the way i had all this in my daemons : CpuD, Xtask 3.0, ZmenuD, FastRun2, ExtD, Extrainfo and Mainscreen Ram Cleaner. Which one i should delete, cause before this i allready try delete some, but nothing change. I mean...Disable all daemons and see if system work correctly. But if you are saying it's useless, then try to check installed patches. If you wrote to phone only Master and ElfPack it couldn't be so... Hmm... Try to reinstall fixes for elfpack... Try to check working master-patches or if you using dis-patches temporary disable them too. And last, i format Micro SD on handset, then copy Zbin folder again, he..he beeep and beep again. Oh i'm sorry about how i mostly get this pexit, it's when i turn off or reboot handset. It's still annoying me Friends, i also try fastrun3, but trouble still exist. And pexit info still the same. 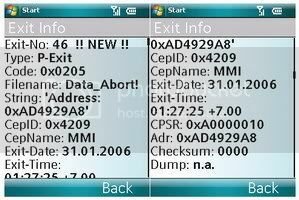 I allready try suggestion from sim_emrom, apply higher MMI prio, then increase PNG cache to 200 (it's max value), but everytime i activate FatRun.elf, then turn off or reboot handset, it's always sounds "beeeep" then off, pexit show CEPname MMI. I also try downgrade to elfpack 2.3, but it's still beeep and off. Hello i've found new fact, looks like it crashed because of Extrainfo.elf and FastRun2 active together. When i delete extrainfo and launch FastRun2, turnoff and reboot working normal. This 2 elf were conflict each other, and it makes turnoff and reboot going bad. Still curious, i found trick, when i moved part of .PNG's files from MMC, to other drive, i use 2: or Config, then it's change, i don't got any crash again. I moved FONTS image, i mean all, to drive config. To receive files from BT to MicroSD you must install 3 patches. I don't that it were correlated with other patch. About patch "Run java-machine with start 1st midlet"
after apply it, i couldn't access menu via push on center navigation key, does anyone experience it too? As for me, eMenu is rather good than standard flexmenu. Actually what are "behind the story" of this two different development, and so i get clear, which one did i had to use? Second, if i take first function library, and upgrade with the second one, is it safe? Finally I've just apply the latest date one, and it's looks more stable, no more crash on reload/reboot. No problem sim_emrom, glad You're finally here , hmm yes i've got many patch update here, and surely go applied right away.